An intermediate-advanced level ‘Intensive Leatherwork Course’, run over 7 days with a one day, untutored ‘Open-Workshop’ midweek. This course is designed to help students master a range of the more advanced traditional leatherwork techniques, in one block. 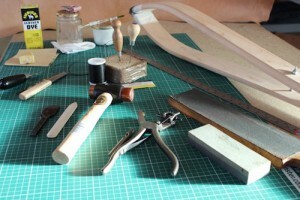 Some of these techniques can be incorporated into student’s own hand-stitched leatherwork project which can be developed during the course and can be completed at home if necessary – all students will be given support in creating an ‘order of assembly’ to take away with them so they can confidently complete their project. Please note: The ‘Intensive Leatherwork Course’ is a demanding week of intensive skills development and students should be aware that this course is not recreational, but is suited to those who wish to advance their leatherwork skills in a short space of time. This course is run annually and places are generally reserved for previous students of GDH Leather Courses. Enquiries are also welcomed from those who have had some previous experience of traditional leatherwork but students should contact us before booking, so that we can discuss suitability.